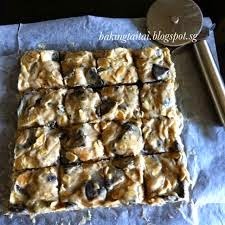 Today is Children's Day and I made these easy non-bake cookies for my two darlings. 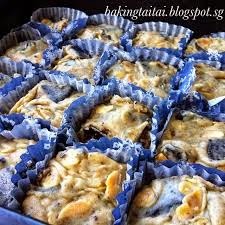 It is a sweet treat from mummy here who saw this recipe from a book -孟老师的100多道手工饼干 which she got recently. It is an easy and no-fuss recipe using only three ingredients. 1. Break the OREO cookies by hands into smaller pieces and set aside. 2. Preheat the oven, top and bottom heat at 150 º C, bake the almond flakes for 12 to 15 minutes until golden brown. 3.Set the bowl of white chocolate over a pot of simmering hot water and use a rubber spatula, stirring quickly to melt the chocolate. 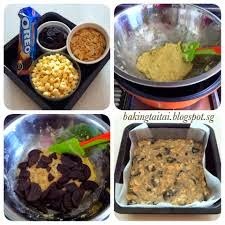 Remove from heat, add in the OREO biscuits and almond flakes, combined together with a rubber spatula. 4. Transfer the mixture to a 18 cm x 18cm square mousse ring (or cake tin) lined with baking paper, smoothen the surface and press it tightly. 5. Leave it at room temperature for 45-60 minutes, or until solidified before cutting into pieces and storing it in the refrigerator. The cookies are placed into individual cookie liners before going into the fridge. ﻿I am submitting the recipe to Aspiring Bakers #36 : Choc-a-cookie (October 2013) hosted by Genie of Honeybee916food.